Please contact us for larger quantities not listed. This is a small list of our print options. Please call us if the item you need is not shown. Don’t have your own artwork? We can help with that as well. Call us for more info. NEXT DAY PRINT ALSO AVAILABLE! 11 Affordable Housing what exactly is affordable housing? Check our the feature on page 11. 13 Steam Museum The Steam Museum has a bit of a face lift to help visitors enjoy there visit. In association with Swindon Theatres, we bring you a selection of shows coming up. 24 Community News Whats happening in your local Community. Robert updates us on some of the latest developments in the area. LANDOWNERS BEWARE – TELECOMMUNICATIONS EQUIPMENT Generally, landowners think that telecommunication equipment is “a nice little earner”. The Operator takes a small area of land, pays over an annual rent – which is periodically reviewed upwards – and all that with little, or no, inconvenience. Whilst that is right, there have always been traps for the unwary. The increase in telecommunications is considered to be beneficial to the economy and therefore the legislation and code are beneficial to the Operator. Given the advantages to the Code Operator under the new Code, can a landowner just refuse to allow new telecommunications equipment to be placed on his land? Regretfully, if the Operator wants to place telecommunications equipment on land, and if there is no agreement, it can make an application to the Court who will, in certain specific circumstance, approve the necessary Order permitting the equipment to be installed on terms it decides. The new Electronic Communication Code brought into effect under the Digital Economy Act 2017 has made the position of the Operator stronger and financially more advantageous. Because of the newness of the provisions there is no guidance as to how the Courts will react but generally a negotiated settlement is preferable. The blog does not deal with the details of the new Code. Because of the intricacies of the new Code, any landowner should seek advice before entering into an arrangement with a telecommunications operator. The Operator will now be able to assign its interest in the equipment without restriction albeit subject to giving a guarantee similar to an AGA. The right to share equipment without paying an increase in the rent. The right to upgrade the equipment without paying an increase in the rent. The method of calculating the rent has been altered in a way which should lead to lower rents. The new Code only affects new arrangements so those who already have arrangements, tenancies or licences may well try to keep those going for as long as possible. The Legislators have thought of that and have incorporated transitional provisions to make the new Code applicable to old tenancies or licences albeit with certain modifications. “Spring is finally fighting its way through and we can enjoy the colour afforded to us by seas of bulbs. Now’s the time to take stock of your bulbs and there health. Are you bulbs coming up without flowers (blind)? This is a problem caused by lack of nutrients which can be made worse by overcrowding of bulbs or naturalising in lawns which are particularly greedy for nutrients. Have a look at your bulbs, lift any clumps that are coming up blind and separate, replanting around a third to a half in the same spot but spread out and either discard or replant the rest in other parts of your garden. This will give them more room to spread their roots and less competition for valuable nutrients. The second step and one to carry out even if your bulbs aren’t blind is to feed them with a general purpose fertiliser (be careful that it’s lawn friendly if your bulbs are in a lawn). This is best done when they are actively growing but adding feed throughout the year will top up levels within the soil so the nutrients will be ready for the bulb to take up”. With news that Swindon Borough Council are set to build 149 affordable homes on land alongside Queens Drive, assuming permission is granted by the Cabinet next week, questions have been raised about what exactly is affordable housing? In January 2016, then Prime Minister David Cameron promised the government would contribute towards the building of new affordable homes pledging £1.2bn over the following five years to build starter homes. easy to understand. Affordable homes should cost no more than 80% of the average local market rent. When it comes to home ownership, it is not quite so clear. In August 2007 the Strategic Housing Market Assessments recommended 25% of gross income as the figure for what was affordable. The government definition of affordable housing published in 2012 states ‘a property must be provided at a level at which the mortgage payments on the property should be more than would be paid in rent on council housing, but below market levels. flooding into a versatile and attractive parking facility for STEAM and Swindon Designer Outlet customers. “We had to find a cost effective, but aesthetically pleasing surfacing solution to accommodate the high volume of traffic to this location and I’m really pleased with the end result.” The car park was constructed using specialist system Golpla® manufactured in the UK by Geosynthetics Limited. This is made from high quality recycled plastics with gravel reinforcement and erosion control and is used at many heritage sites throughout the UK. medics and our charity team to enable us to continue to save lives in the future. “We have received amazing support from people for our new airbase, including donations, and we’d like to thank everyone for their backing.” Currently the charity leases offices in Calne for its fundraising and administrative team and leases the hangar at Wiltshire Police headquarters in Devizes for its helicopter and aircrew. The new airbase has a Flight and Operations Centre for its aircrew, a hangar for the helicopter and medical equipment, offices for the charity team, training suite and a visitors’ viewpoint. Kevin Reed, Head of Facilities and Security at Wiltshire Air Ambulance, has led the new airbase project on behalf of the charity and said the site at Semington was chosen after an exhaustive search. MY SWINDON AND YOURS and estates on which you live and how they got their names, we wil reveal all here. MY SWINDON AND YOURS. 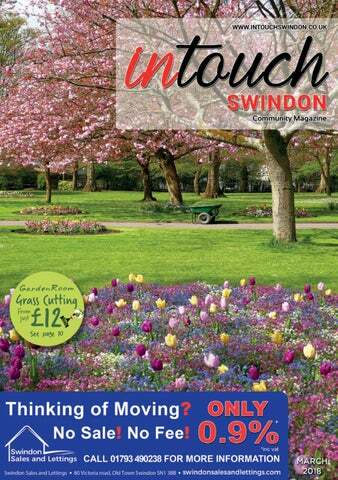 In each edition of this magazine I will be telling you a little of my beloved Swindon, its history and its past and how we got to where we are today, From the Roman settlements at the time of Christ to the modern estates of the 1950s, 60s and 70s. From the treasures in Swindons four Museums, in Old Town, at Coate Water, and the two Railway ones plus Wroughton Aerodrome most of which many of us have never seen to the future that we hope to see in our Town. From the great people of this Town and the influence they had in shaping our Town and our Country as well. From the Industrial Revolution in the 18th and 19th century’s and the coming of the Canals to Swindon, and then to Gods Wonderful Railway and the longest factory in the World. From the Norman landlords after 1066 to the Goddard family, and their influence on the Town, and from the first industries like Quarrying by the Romans, to the building of Spitfires in the Second World War. From the affluence of the Folks on the Hill to the Work houses of the poor and the way that the Trade union movement came from distroying farming machinery to making Swindon workers some of the best paid factory workers in Britian. From the history of Swindon buildings like the Mechanic’s Institute and its lending library, the first in Britian, to the Start of the N.H.S which was a copy of ( from the cradle to the grave ) the policy of the G.W.R. From the great writers and poets like Richard Jefferies, and Alfred Williams, that told the story of Swindon and its surrounding area to modern day Writers and how they see this Town of ours. From the Parks and Gardens of the Town to Coate which in the past I have called the Jewel in Swindon’s Crown. And from the hundreds of history books that have been written about Swindon, we will dip into and relate some of the most intesting facts and pictures around and about in our Town. on the Canals to the Welsh settlers who built the Rolling Mills in the Railways and had their own Estate and Chapel in Westcott Place called Cambria, the Roman name for Wales. We have always been a multicultured society and today well over 100 languages are spoken in our Town. This is just a snippet of what you can expect from this Magazine and your feedback would be greatly appreciated. Let us have your story’s and memoirs of Swindons past, remember we have to get them down on paper to make sure that others generations read them in the years to come, you are all Swindons history in the making. lyto tackle the threat and are experiencing broadly 30 per cent more counter terrorism work than a year ago. real life foiled plots, which will show examples of terrorist-related suspicious activity and behavior, as well as attack planning methodology. Newly-appointed Assistant Commissioner of Specialist Operations (ACSO), Neil Basu, praised the public’s willingness to ACT in response to last year’s unprecedented rise in terrorist activity, which resulted in record numbers of people contacting the police through online referral forms and the confidential hotline to report suspicious behaviour and activity. A call to action will encourage the public to report suspicious behaviour and activity via the online tool (gov. uk/ACT), helping the police to prevent terrorism and save lives. public about terrorist attack planning and reinforce the message that any piece of information, no matter how small, could make the difference between a lethal attack or a successful disruption. “Like other criminals, terrorists need to plan and that creates opportunities for police and the security services to discover and stop these attacks before they happen” says ACSO Basu. “That could be someone buying or storing chemicals, fertilisers or gas cylinders for no obvious reasons, or receiving deliveries for unusual items, it could be someone embracing extremist ideology, or searching for such material online. An Evening with Dan Snow comes to the Wyvern Theatre on Tue 10 July and will feature the well-known historian and TV presenter recounting anecdotes of memorable experiences from his very successful career as an historian and broadcaster. Nain, was a huge storyteller. She taught me to give history a human element and to bring it alive. I hope my history is very real and vivid because of her. Q: So were you were introduced to the joys of history at a very young age? A: Yes. Every weekend as a child, I was taken to a historical site, a castle, palace or a museum. I got History Stockholm Syndrome as a boy, and now I’m inflicting it on my own children! I don’t bother asking them how they feel about it. They seem to tolerate it – they don’t know any better! Two weeks ago, I took my two-year-old daughter to HMS Victory. It was just another day in the office for her! Advance tickets for Dan Snow: An Evening with ‘The History Guy’ are available from swindontheatres.co.uk or on 01793 524481. Dan Snow also runs his own online TV Channel, History Hit TV (tv.historyhit.com/), which brings you great history documentaries and podcasts, and has a regular ‘history’ slot on The One Show. The Gemma Short School of Dance & Theatre Arts Conveniently based location on Victoria Road, Swindon, the school provides fully equipped studios and excellent teaching. Students aged 3 and above will be offered many disciplines including Ballet, Tap, Modern, Jazz, National, Drama, Singing and Musical Theatre. The school also offers many adult classes as well as Music, Movement and Make Believe for 1-2 year olds. Students will be offered examinations in all subjects and also be encouraged to perform in our showcase evenings. The Great Jaydini Easter Magic Show| 4-6 year olds Wyvern Theatre - THU 5 APRIL Enter the funny and magical world of The Great Jaydini, a talented and professional magician whose unique style puts together a blend of comedy and magic suitable for ages 4-6. Community NEWS tion you can visit the Council’s planning portal at www. swindon.gov.uk/publicaccess. The reference number for this application is: S/18/0265 Nythe Doctors Surgery The Nythe Doctors Surgery is set to close with all its patients being transferred to the Eldene Doctors Surgery. As a patient of this surgery I find it disappointing we are being moved to a surgery quite a distance from the Coleview area. Road is currently in breach of the government’s annual air quality objective. Air pollution if not addressed has been associated with a number of adverse health effects. In declaring an Air Quality Management Area Order the Council will be able to apply for additional funding from DEFRA to address air quality. Swindon. A HMO application is currently outstanding on appeal at the old Stanwells shop and a shared house application has been submitted at the former Nicholls Butchers Shop on Kingshill Road. The Eastcott Labour Team have campaigned against and objected to overdevelopment and inappropriate HMO applications in Eastcott and Kingshill. We would like to know your views on how the Council can reduce air quality in the Kingshill area. Any comments we receive will be fed in to the Council Steering Group. SHINING A LIGHT ON WOMEN IN THE CRIMINAL JUSTICE SYSTEM Not only does the Police and Crime Commissioner for Wiltshire and Swindon allocate the budget for Wiltshire Police, but he also commissions a number of services that work alongside the police and criminal justice system including victim support, offender interventions and drug and alcohol programmes among many others. She works with Wiltshire Police and partner agencies to identify service gaps and alongside key stakeholders’ aims to improve areas within the Criminal Justice System to ensure that victim’s voices are heard and that outcomes have a positive impact on offenders. On International Women’s Day 2018, it seems fitting to celebrate the impact that the wider office makes to the criminal justice system. It is fair to say that it is historically known as ‘a man’s world’ however more and more women are now Carolyn said, “I spend a lot of time working both in court and beyond to ensure the best possible outcome travelling around the county to various meetings visiting lots of diffor both victims and offenders. ferent people. Meet Carolyn. “To be in a job where I can help to shape the future of the Criminal Prior to joining the Officer of the Justice System to make a positive Police and Crime Commissioner difference to people’s lives is very (OPCC), Carolyn had worked with fulfilling. Wiltshire Police for three years as an Out of Court Disposal Manager. I am also fortunate enough to work with some amazing, innovative and Now working alongside Police and Crime Commissioner (PCC), Angus passionate people, both within our office, within the partner agencies Macpherson she concentrates on the criminal justice system and reha- and the people in our communities. bilitation for offenders. easter eggs about! With Easter approaching the amount of chocolate around the house increases and so the risk of chocolate poisoning for our canine companions increases. So what to do if your dog eats chocolate? Contact your vet immediately! If you know the quantity your dog has eaten this can help the vet determine if the dose is of toxic levels. SNDogs are very pleased to be back as a regular feature in the new InSwindon Magazine for 2018. We would say a BIG ‘Thank You to Nationwide Building Society (Optimus House) in Swindon who donated the monies raised from their Dress Down Day in January – we were also invited along to Optimus House at the end of February to have a stand and hold a raffle where we raised £116.61. PIMMS PIMMS is a male sent hound who was found in a pound in Spain and was on the kill list. MOLLY is a female Pachon Navarro breed. She was in an awful state a year ago when she was rescued from the fields. A cricket ball size hernia, bleeding sores all over her body from Leishmania. After the treatment, operation and lots of TLC she is a lovely healthy dog just on a tablet a day. As with this breed she likes exercise but plenty of cuddles as well. If you can offer either PIMMS or MOLLY a home please contact us! SNDogs relies entirely on donations - there are many ways you can help SNDogs. Donate via Paypal – swindonsneedydogs@gmail.com or bank transfer to (Co-op) Swindons Needy Dogs Account No. 65622481 sort code 089299. We also have an Amazon Wish List – search for Saving Needy Dogs. Dog lovers wanted: Enjoy the company of a canine guest! Open your home to a friendly dog for his holiday. Whilst owners are away dogs get the love, exercise and companionship of your loving home. Across the Trust there have been lots of opportunities for pupils and staff to work together. Year 11 attended an assembly by Angela Bell, RWBA Assistant Headteacher and Head of Sixth Form and over 30 Lawn Manor pupils attended a sixth form experience day where they had the opportunity to try the various subjects on offer at RWBA. In November pupils from both schools were invited to the Field of Remembrance Service at Lydiard Park. To engender some competitive fundraising among staff and students the Trust embarked on Movember where it raised awareness and funds for Prostate Cancer UK. In February the schools shared their first joint residential, a skiing trip to Italy where staff and pupils from both schools had a great week of fun. George Croxford said he wanted the schools to strengthen each other and to build capacity for the future. Talks are underway to expand the opportunity for Lawn Manor pupils to include a sixth form as the school grows. The philosophy of the Trust is that we can achieve more together and this is exactly what is happening. ment with a minimum term of 26 years in January at the Central Criminal Court. The minimum term was increased after the Solicitor’s action, meaning Johnson will now serve at least 30 years behind bars. Robert Buckland QC MP presented the case personally to the Court of Appeal. Speaking after the hearing he said: “This was a vicious and brutal attack which ended in the tragic death of a woman. The offender is a danger to women and his crimes deserved tougher sentencing.